Hey ladies, here's another giveaway that will pretty sure, wake you up every mid of the month! Aside from the ASK MR. VARGAS as Vedette's monthly giveaway, we've come-up with something new... THE PERFECT MATCH GIVEAWAY! You just have to let your inner fashionista in you to come out and play dress-up! 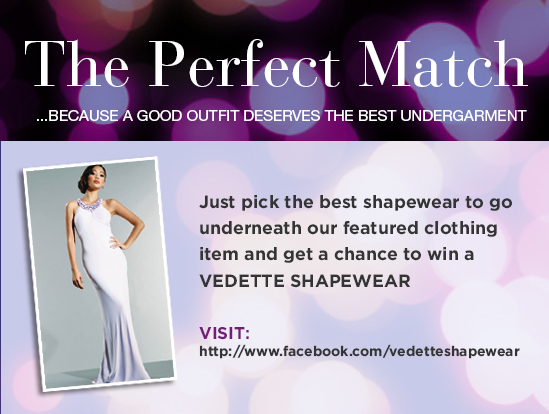 This time, you just have to pick the BEST shapewear possible, to be worn on our featured clothing item! We will have some choices and all you got to do is say which among them you think is the best! And be sure also, to share on your facebook timeline the giveaway, to make your entries valid. 3.. You just need to pick the perfect match shapewear for the featured clothing item we will be posting on our timeline. 4. Comment which among the 3 shapewear pieces you think is the perfect match for the featured clothing piece. 5. The most picked shapewear among the 3 choices, will become the GRAND PRIZE and will be declared the "Perfect Matching Shapewear" . 6.Three (3) winners will be randomly picked with which, each will get one (1) mystery shapewear. 7. One (1) grand prize winner will be picked among the fans who have chosen the most picked shapewear among the 3 choices/ "Perfect Matching Shapewear"
8. All entries should be in, on or before the deadline.